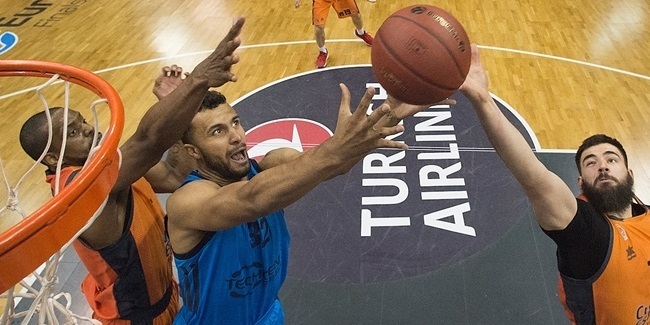 ALBA Berlin got back on the winning track with an overtime triumph at Rytas Vilnius on Wednesday to stay strong in Group E of the 7DAYS EuroCup Top 16. The main catalyst in that win was forward Luke Sikma, whose performance index rating of 33 earned him the MVP honor for Top 16 Round 3. Sikma had a solid all-around game, with 19 points, 12 rebounds and 6 assists in 33 minutes. In so doing, Sikma set new career highs in rebounds (12), defensive rebounds (9), and minutes played (33). The second-best individual performance this week came from UNICS Kazan shooter Jamar Smith. His PIR of 29 was a personal best for him, as were his 10 assists. He also added 19 points, 3 rebounds and 3 steals and downed 5 of 7 three-point shots, extending his streak of making at least one triple to 50 games. 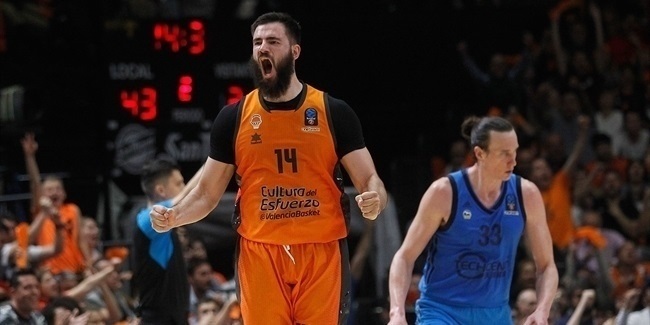 The top five individual performances of the week were completed by Andrija Stipanovic of Cedevita Zagreb (PIR 26), Jarrod Jones of AS Monaco (PIR 25), and Artsiom Parakhouski of Rytas (24). The top scorer of the round was veteran Vitaly Fridzon, whose 24 points in Lokomotiv Kuban Krasnodar's road win marked his personal best in 68 career EuroCup games. Diante Garrett of eliminated Tofas Bursa still leads the rankings with 18.4 points per game. Sikma led all players under the glass with his 12 boards, but Zenit St Petersburg's Jalen Reynolds leads all rebounders this season with 8.6 per game. Smith's 10 assists for UNICS were also the high mark of the week. Zenit St Petersburg's Gal Mekel is the new season leader in that department with his 6.6 assists per game. Several players got as many as 3 steals each this week: Smith, Jones, Valencia Basket's Guillem Vives, LDLC ASVEL Villeurbanne's DeMarcus Nelson and Partizan NIS Belgrade's Bandja Sy. Javonte Green of ratiopharm Ulm is the season's steals leader at 2.6 per game. Finally, Maurice Ndour of UNICS and Alpha Kaba of ASVEL had three blocks each to lead the Top 16 Round 3 rankings. Two players from eliminated teams, Uros Lukovic of Mornar Bar and Robert Upshaw of Arka Gdynia, lead the season rankings with 1.7 blocks on average.